Today, the National Museum of Contemporary Art, Korea (MOCA) unveiled its new Museum Identity as the National Museum of Modern and Contemporary Art, Korea (MMCA). MMCA Gwacheon: the main building (near Seoul Grand Park) was inaugurated in 1986, but the institution itself was established in 1969 in Gyeongbokgung, and moved a first time to Deoksugung, in 1973. MMCA Deoksugung: the MOCA returned to Seokjojeon, where the focus is on modern art (museum collections, international exhibitions like the recent "Memory of landscape I have never seen", featuring collections from the National Gallery in Prague). Just hectometers away from SeMA Seosomun, via Jeong-dong-gil. 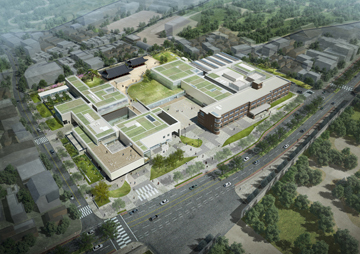 MMCA Seoul: the new Sogyeok-dong branch will be inaugurated in November this year, and the MMCA regularly posts pictures of the new structures. Many of the fences have already been removed, so everybody can see the former Defense Security Command and Military Hospital emerge in new clothes and surroundings. I'm glad they dumped the "UUL National Art Museum" brand, which sounded like "melencholy" in Korean. About this saga, see former posts, particularly "ASYAAF 2009" (July 2009), "Shinhotan, Beginning of a new Era - a big MOCA cup for Seoul" (October 2009), "MOCA @ Defense Security Command, continued" (February 2010), "SeMA to block blockbusters" (February 2012). I can't wait to visit the new museum and its collections this November. Two other exhibitions are planned for the inauguration: "The Birth of a Museum: MMCA, Seoul Archive Project", and a "On-site Production and Installation Project" featuring SEO Do-ho, CHOE U-ram, and Young-Hae Chang Heavy Industries. THAT would be quite a shift from the 70s for this building!